The season finale for "Agent Carter" has arrived. If this finale made me realize anything, it was that I am more than ready for the return of "Agents of S.H.I.E.L.D." Sure, I like Peggy Carter as a character, and I love Hayley Atwell. She has done a good job turning a supporting character into something much more. I applaud her for taking this mini-show on, and I feel she helped make it more than it could have been. But I think ultimately, this is my least favorite thing Marvel Studios has conjured so far. I think it was fun and I don't think it will come close to destroying what Marvel has built so far. Far from it. I just think that just because one character is cool or sticks out in a particular movie, that doesn't automatically mean we give him or her a television show. Leviathan stealing weapons from Howard Stark? That seems like a cool idea. Using Howard Stark to try and destroy a portion of New York City? Yeah, its interesting and it sets up for a conflicting, engaging storyline. Yep, Howard Stark (Dominic Cooper) shows up to help Carter clear his name and shines some light for the SSR on who Dr. Ivchenko (Ralph Brown) was and why he helped build the group Leviathan. As careful as the SSR were, they couldn't stop Howard Stark from being kidnapped by the bad guys. The problem? Well, we know that Howard Stark helps create S.H.I.E.L.D. We know he fathers a boy who will later become Iron Man. We know that he will die in a car accident with his wife. We have known this since "Iron Man" aired in 2008, so when Howard Stark gets kidnapped there really is no tension. We know Agent Carter is going to get him out of this one because the franchise needs it. The way the show laid it out, it felt like they tried to make this particular scenario feel desperate, but how much desperation can you milk out of something that we know will turn out okay in the end? As good as everyone tries to get this one, the foundation of the episode is unsurprising. I will miss James D'Arcy's work as Edwin Jarvis, he continued to make each episode worthwhile. I also couldn't help but get a little excited within the final moments of the episode. When Dr. Ivchenko meets a certain cellmate and that certain someone recreates a horrid organization. 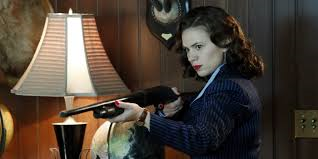 I loved it, and now I am at least a little curious to find out if "Agent Carter" gets renewed. So I guess that by itself is something good about the finale.